For a limited time, get instant 5% OFF when you purchase $100 or more from Ahaarya. Discount automatically calculated at checkout. Stay cool this summer in this beautiful Anarkali style white flared Kurta. Also available in plus size. Look stunning and cool in this Anarkali style flared white georgette kurta. 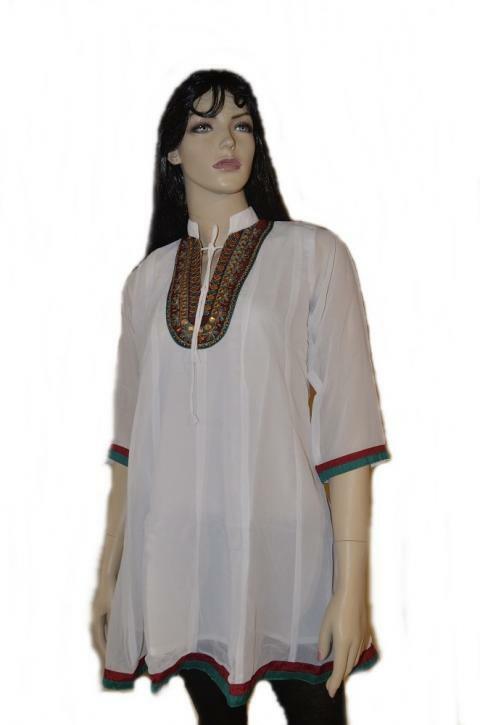 The kurti has beautiful delicately embroidered neckline with mirror work. It also has double piping on the daaman and sleeves. Pair this kurti with leggings or jeans for a complete summer outfit or try them with jaipuri block print skirt. Available in all sizes from Small (38) to 3XL(48) - plus size. Shipping Cost $6.50 Buy multiple items online from Ahaarya to SAVE on shipping. All orders will be processed within 3 business days, once payment is received. If you have any other question, please contact us. All merchandise is shipped from our warehouse in New Jersey, USA. We want you to be satisfied with your purchase. If you do not like our product, please contact us within 24 hours of receipt of shipment to get a Return Approval. We will review your return upon receipt and notify you within seven business days. Any unauthorized or improperly packed package will be returned to sender. Items that show signs of wear or have been used, altered, or damaged in any way cannot be accepted for return. This item in Indian Kurtis & Tunics category was first added to our catalog on 10-10-2012. Buy Anarkali Style Plus Size Kurti in White Georgette, sold & shipped by Ahaarya where you can shop online for Latest Fashion Indian Dresses, Sarees, Salwar Kameez, Kurtis. This Kurtis & Tunics collection has been tagged as Plus Size, Anarkali Kurta, Designer Indian Clothes Shopping, Party Wear, Indian Tunic.